I was such a goddamn tech cliché this week. In our wearable tech types feature, we described the stereotypical beginner runner as an "aspiring athlete" who is "strapped to the nines with fitness tech, most of it only suitable for elite runners". Read more: Which type of wearable user are you? "This guy's producing more data than the entire Tour De France peloton – and he only popped out for two miles around the local park." Does the pic below look familiar? On my jogs this week I wore the Fitbit Charge HR fitness tracker, Jabra Sport Pulse heart rate monitoring headphones and a Wahoo Tickr X heart rate monitoring chest strap. All at once. The result? They made my Couch to 5K outings more fun and more useful than ever. Honest. As you might remember from Week 5, I've fallen a little behind the Couch to 5K app schedule due to life getting in the way. If I were using a rival training plan which allocates rest days and running days, it would be going berserk at me right now. The Active.com app simply changes the message below each week's summary when you open it up to remind you to get going again. Easier to skive, sure, but I'm getting myself back on track. If you've done the same but you're comfortable picking up the longer running intervals then I shouldn't think there's any reason for you to quit now. I'm not - OK that's partly because I might get fired from Wareable but mostly because running three (ish) times a week is actually doing wonders for my discipline. On account of missing a session, starting Week 6 late and being tempted away from sticking to my MyFitnessPal calorie/fat count by bad influences, I have also discovered that I have lost precisely no weight since I started this Couch to 5K challenge. My aim was always to get fit enough to run 5K easily but of course I secretly hoped I would lose some weight along the way. I am getting fitter though, I can feel it, back to the level I used to have when I went out for more sporadic jogs. And that feels good. The weight can wait. I've continued to wear the Fitbit Charge HR almost everyday and I'm beginning to think it's a keeper - unless something like the Sony SmartWatch 3 ousts its off my wrist. I'm not hitting 10,000 steps a day yet - I averaged 6,748 this week but considering I work from home part of the week, I'm OK with that. I've also charged it just the once this week so if you use it lightly like me, you can probably get away with once a week. Nothing compared to the months a Jawbone UP Move or Misfit Flash will last, both cheaper, but neither offer the screen with glanceable step counts, distance and calories burned which can be nice and motivating throughout the day. I mentioned in Week 5 that Fitbit's software is impressive at motivating in general and I was glad to get my Lighthouse badge for 'floors climbed' this week after a trip down to Dover for a walk along the cliffs. I actually had a hot chocolate and scone in a lighthouse at the end of the walk so I was a little freaked out when I got the email. Pure coincidence: turns out Fitbit doesn't know everything about my life. Still, Fitbit's other, older trackers offer the app, the step counting, it's the continuous heart rate tracking that's the real draw. Likewise for the brilliant £180 Jabra Sport Pulse. On my non rest days I finished off Week 5 with the 20 minutes straight jog which I didn't quite manage without slowing down to briskly walk for 30 seconds/a minute. Twice. But I'm not too deterred as Week 6 ends with a 22 minute straight jog and already going back to intervals feels better - Week 6 started with a session made up of a 5 minutes jog, 3 minutes walk, 8 minutes jog, 3 minutes walk, 5 minutes jog. Easy. I really got on with the Jabra Sport Pulse, there I said it. It's a pair of wireless, heart rate tracking earbuds that are connected via a cable that goes round the back of your head with a set of controls for volume and skipping music tracks just below the right ear. So already you have the bonus of wireless music and Couch to 5K coaching, they're light too and thanks to four sizes of ear gels and four sizes of 'wings' I managed to get a snug fit with no falling out. My only complaint is the sound quality was a teensy bit disappointing to me - I really do need music to get me going and there was something a bit thin about the sound of the Sport Pulse. Not enough for me to abandon them but certainly noticeable next to the Sennheiser in-ears I usually run with. Oh and one more small complaint - setting it up is really quick, including the heart rate tests, but you have to download two Jabra apps to get going which is annoying. As I said, I went running with the Jabra Sport in my ears, the Fitbit on my wrist and a Wahoo Tickr X strap round my chest as they all track heart rate. Now, if you want to get really serious about training harder and harder using heart rate zones, get the strap - it works with iPhone and Android and it's going for £80 which I think is a fair price. For beginners like me who've worn running watches before but never a strap, it feels a bit odd around jigglier middles than it's perhaps intended but you'll soon get used to it. Now, last week I didn't take the Tickr X out with me as I saw that my Moto X doesn't support ANT+ - if I'd waited 20 seconds more, my phone would have discovered it via Bluetooth so there you go. I'm an idiot. In my defence, I've tried to act like a real beginner runner throughout this, one that will 'give up' at the smallest sign of faff especially at the setting up stage. This is still a big problem for wearables. Now to the comparisons. Essentially, the Fitbit and the Jabra gave me very similar results but were generally higher by about 5 points than the Wahoo throughout my run. For instance, I'd get 163bpm and 165bpm from the Charge HR and Jabra respectively and 159bpm from the Wahoo chest strap. It was a similar story in the walking intervals - 122bpm from the Tickr X was 125bpm from the Pulse Sport and 127bpm on the Fitbit. Running in these lower fat burning and aerobic zones, I don't think beginner runners should be too worried that their smartband or smart earphones are slightly inaccurate as long as you're aware they might be a little high. But as Kieran Alger found in his Jabra Sport Pulse review especially at higher heart rates, it can give readings that are as much as 10bpm higher than a chest strap, like the Wahoo, making you think you're working harder than you really are. We don't want that. If you're interested in more comparisons, look out for an in-depth feature on Wareable within the next month as we'll be comparing three popular fitness trackers to a Garmin Forerunner and chest strap combination on two levels of runners. Testing so many running gadgets at once has given me a clearer idea of my perfect wearable tech system for beginner runners. I'm totally sold on the wireless earbuds - most beginners won't be running in half marathons any time soon so won't have the sudden shock of not being allowed to wear earbuds. I need my music and I like that apps like Jabra have shortcuts to services like Spotify, something lacking in my Couch to 5K app which only plays nice with the default music app. Of course, something like the upcoming Bragi Dash would be even better as these earbuds communicate wirelessly with each other as well as your smartphone. The Sony SmartWatch 3 - which I will get to, I promise - would be a good companion as you can store music on the watch itself which also has built-in GPS. Once the Couch to 5K programme is over, and unless I immediately start training for a 10K, I'll be able to go out running without my smartphone finally. 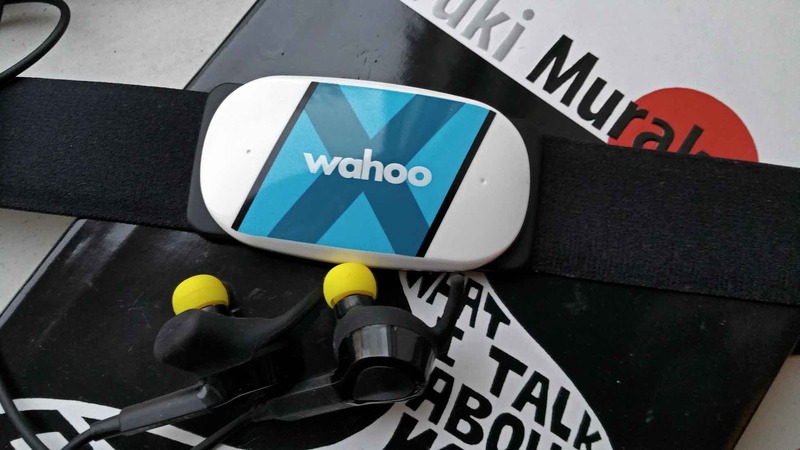 I'm not convinced a chest strap like the Wahoo Tickr X is a must have for a Couch to 5K beginner but as a step up accessory to really get the most out of your running, it's comfortable, accurate, and good value for money. For me, though, the most important thing isn't the tracking, the graphs or the bpm, it's continuing to get out there, in the cold, knowing that if I've had a bad day then after my first 8 minutes or so on the road, I can make myself feel a certain way just by running - calmer, more focused and yes still a bit huffy and puffy. With the wearables and apps waiting, I've found myself much more likely to not let them (and by them I mean me) down.